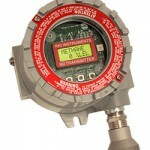 The Beaconª 200 is a powerful, low cost fixed system controller for two points of gas detection. It is microprocessor controlled, versatile, simple to install and operate, and priced to be the industry’s most economical two point controller. It is capable of connecting directly to RKI sensors for LEL level combustibles, Oxygen, Hydrogen Sulfide, or Carbon Monoxide. 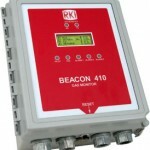 The Beaconª 200 can also accept any 4-20 mA transmitter (2 or 3 wire, 24 VDC). Sensors can be mounted directly at the Beaconª 200 housing, or can be wired remotely from the controller. The Beaconª 200′s housing is rated NEMA 4X for corrosion resistance and a weather tight seal, and complies with lock out / tag out standards. An external reset switch allows the alarm to be silenced from outside of the controller housing. The Beaconª 200 comes complete with a wall mounting kit for easy installation. 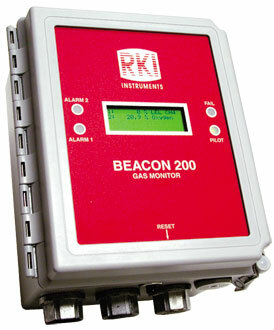 RKI offers the industry’s widest selection of standard and toxic gas detection sensors, which can be utilized with the Beaconª 200, providing gas monitoring protection for almost any application.